Finding the perfect car seat for your baby is one of the most important and stressful things you will do as a new parent! You will find yourself asking questions like: Will it be safe? Comfortable? Lightweight? Well-made? Will it fit in my car? What are the crash test ratings? How long will it last? Will my baby grow out of it? What if I have a preemie? Does it fit my style? And finally, can I afford it? Add these questions to the constantly changing requirements and recommendations of car seat experts, and things can get serious really quickly. No need to stress - our car seat buying guide will give you the information and confidence you need to find the perfect car seat for your family's unique needs. Forward-facing versus rear-facing. Let's begin with the difference between rear-facing and front-facing car seats. All babies will start rear-facing, which means that they will be facing the back of your vehicle when they are sitting in their car seat. The rear-facing position is the safest seating position for a baby, as it reduces the way the body absorbs impact in the event of an accident. The below animation shows the difference between impact sustained by a baby during rear-facing versus front-facing configurations. The baby on the left is in a rear-facing infant car seat, and the baby on the right is in a front-facing car seat. Notice the differences in the way the baby's body (including their head, neck, spine) absorbs the impact in the front-facing position. In contrast, notice how the car seat itself absorbs the impact in the rear-facing position, keeping the baby in a secure position and minimizing the risk of injury. To increase safety, all babies should remain in a rear-facing car seat position for as long as possible. After they reach a certain height (usually about 40" tall and 40-50 pounds), car seat manufacturers recommend putting the baby into a forward-facing car seat. As the name suggests, forward-facing car seats position your baby so that they are facing the front of the vehicle while sitting in the car seat. Forward-facing car seats are typically positioned at less of a recline, and can accommodate children upwards of 40-65 pounds or more. Now let's get into the differences between the types of car seats that adopt forward-facing and rear-facing positions. Infant Car Seats: These are the most commonly purchased car seats for newborn babies. The infant car seat is restricted to the rear-facing position, can be used with newborn babies, and has a carrying handle to help parents carry their baby around in the car seat. Typically, the infant car seat snaps into and out of a base that is left in the vehicle, and can also be snapped into and out of a stroller. Most infant car seats can support preemies with an infant insert, and are generally rated for babies as little as 4 pounds and up to 30-35 pounds. You can read our reviews of the best infant car seats here. The advantages of an infant car seat include: being able to easily snap the seat into and out of the base and a stroller, rather than possibly waking your baby by removing them from a car seat, and they also tend to be lighter-weight than a convertible car seat and are easier to switch between vehicles. But they are also restricted in a few ways, including their inability to be positioned in relatively upright rear-facing positions (for toddlers), their limited leg room up against the rear seat, and their limited weight and height restrictions. Once your baby is over about 20-25 pounds and they become very heavy to carry around in an infant car seat, you will probably want to switch to a convertible car seat. Convertible Car Seats: The convertible car seat, as the name suggests, can convert from a rear-facing car seat to a forward-facing car seat. That is called a 2-in-1 convertible car seat. Some others are 3-in-1 convertible car seats, which can convert from a rear-facing infant car seat, to a forward-facing car seat, to a belt-positioning booster car seat. The belt-positioning booster removes the car seat's harness and uses the vehicle's lap and shoulder belt to secure the child into the seat. Finally, there are the 4-in-1 convertible car seats, which can also convert to a bottom-only backless booster car seat. The 4-in-1 car seats are sometimes called all-in-one car seats. So, the convertible car seat can be super versatile, and you can use it for newborn babies all the way up to a child who is upwards of 10-12 years old! Some newer convertible car seats, such as the Graco Extend2Fit and Nuna Rava, support rear-facing all the way up to 50 pounds, which means that you can use a convertible car seat for rear-facing for much longer than an infant car seat. And it will be more comfortable for bigger and older kiddos, because it can be positioned at a much more upright recline setting. You can see our reviews of the best convertible car seats here. There are two main disadvantages to the convertible car seat: first, it is much bigger and heavier than an infant car seat, and second, it cannot be carried around or easily swapped between vehicles. Booster Car Seats: Booster car seats come in three types, all of which are forward-facing. First, there is the combination booster car seat, which starts as a booster car seat with an included 5-point safety harness, and attaches to your vehicle with either the LATCH system or the vehicle's seat belt. Once your child is over 40-pounds, you can remove the 5-point harness and use this car seat as a belt-positioning booster seat. That means that your child will use the vehicle's lap and shoulder belt, and the booster will correctly position the shoulder belt. The belt-positioning booster seat is the most common type of booster car seat, so be sure to check out our reviews of the best booster car seats. Finally, there is something called the backless booster seat, which is a bottom-only booster car seat. Your child will use the vehicle's lap and shoulder belts, but there is no back on the booster seat to position the shoulder belt correctly. So, technically a combination booster car seat can be used as early as 25-pounds, and last all the way up to over 100 pounds in some cases. We do not recommend using a booster car seat until your child is at least 2 or 3 years old, at least 40 pounds, and at least 40" tall. The American Academy of Pediatrics (AAP) makes annual recommendations for car seat safety (see the newest one here). These recommendations are summarized in the following image, which is extracted from the NHTSA Child Car Safety guidance. 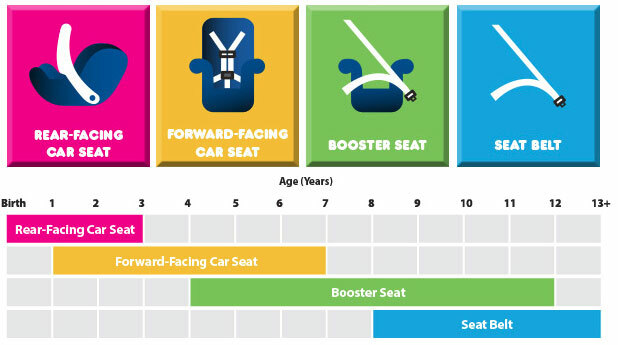 As you can see in the chart, your baby will always begin in the rear-facing position, and maintain that position until they reach the car seat manufacturer's height or weight limit. This applies for both infant car seats and convertible car seats. Most infant car seats max out at 35 pounds. Some new convertible car seats car support children in the rear-facing position all the way up to 50 pounds! For example, the Nuna Rava, Graco Extend2Fit, Maxi Cosi Magellan, and a few others (we review all of those in our best convertible car seats article). Then your child will transition to a forward-facing car seat with a 5-point harness until they are about 7 years of age. Then they should transition to a booster seat until they are about 10-12 years old, and then finally to using the vehicle's seat belts. Of course, these are very general guidelines and will change if your child is shorter or taller, or smaller or larger than most children. They are also only roughly summarized here; for a more thorough explanation, see our AAP policy article here. Also, just because the government makes a recommendation for car seat usage, be sure to check your local laws and also double-check the car seat manufacturer's guidelines! Parents make pretty consistent mistakes with car seats. To see the most common mistakes parents make when installing and using car seats, see our blog post here. Your Car Matters. If your car is newer than 2002 it will very likely have a LATCH (Lower Anchors & Tethers for Children) system. The LATCH system was introduced into most vehicles as of 2002, and is designed to make proper car seat installation easier and faster for parents. When using the LATCH system to secure your infant car seat or convertible car seat into the vehicle, you will not need to use the vehicle's seat belts. But keep in mind that the LATCH system can only be used until your child is about 40 pounds, then you will need to use the vehicle's seat belts to secure the car seat into the vehicle. Also keep in mind that cars, minivans, SUVs, and trucks come in all different shapes and sizes. Some of the bigger infant car seats and convertible car seats might be very large in a smaller vehicle, and even push up against the front passenger's seat when installed rear-facing. Another issue is the width of the car seats, especially if you plan on using more than 2 car seats in the back seat at a time. If you have a smaller vehicle and are worried about fitting 3 car seats in a row, check out our reviews of the narrowest car seats here. Installing a Car Seat. We quoted a pediatrician up above, who noted the importance of a properly installed car seat. Once you find the best car seat for your baby, it is critical that you install it correctly. Please take the time to watch car seat installation videos, fully read the owner's manual, and don't feel afraid to ask for help. Most fire departments have a Child Protection Safety Technician (CPST) on staff, and if not, you can search for one here. Even with the safest car seat, your child will not be safe if it is improperly installed. Car Seat Safety Features Matter. This is a matter of fierce debate. On the one hand, you have the car seat manufacturers and crash test data demonstrating the safety advantages of side impact protection, anti-rebound bars, and load legs. On the other hand, you have CPST instructors stating that all car seats meet federal safety guidelines and are therefore safe for your child. Our stance is somewhere in the middle. We acknowledge that the federal safety guidelines are established to ensure that all car seats sold in the USA are safe for your child, and that proper installation is more important than having additional safety features. But we also acknowledge the scientific data demonstrating that car seat safety devices can reduce the energy absorbed by your child in the event of an accident, and likely reduce injuries as a result. All parents need to make these decisions on their own, especially considering that the car seats with the most safety features also tend to be the most expensive car seats on the market. There is a middle ground, and in our best infant car seat reviews and best convertible car seat reviews we do our best to try to find that happy medium. Think about the Stroller. If you're going to use an infant car seat, you're probably doing it because it adds the convenience of being able to pop the car seat out of the vehicle and pop it right into a stroller. So be sure that the stroller and car seat you plan on using are compatible with each other! You are usually safe if you're buying an infant car seat and stroller made by the same brand. For instance, Graco uses the ClickConnect system to guarantee fitment - if the car seat says Click Connect, it will fit into a stroller that says Click Connect. Same situation for Chicco, Britax, and the other major infant car seat brands. No-rethread Harness. The height of the 5-point harness is very important for your child's safety. As your child grows, you will need to raise the height of the harness to accommodate their new shoulder height. Many budget car seats require that you manually rethread the shoulder harness through holes on the back of the car seat in order to adjust their height. Most modern car seats, and all of the more expensive car seats, include a no-rethread harness that adjusts up and down at the click of a button, usually along with the headrest height. We highly recommend buying a car seat with a harness that does not require rethreading for height adjustment. High Rear-facing Weight and Height Limits. As mentioned above, the AAP strongly recommends that you keep your baby rear-facing for as long as possible. Traditionally, this was limited by the car seat manufacturer's low limits for rear-facing weight and height limits. Now, car seats are being made that can accommodate much higher weights and heights. For infant car seats, some examples include the 35-pound weight and 35" height limits of the Chicco Fit2, and the Peg Perego Primo Viaggio 4/35 has 35-pound weight and 32" height limits. That's pretty good for rear-facing infant car seats. Even better are the convertible car seats, such as the Nuna Rava and Graco Extend2Fit, that support up to 50 pounds rear-facing! Of course, you'll probably reach the height limits of those seats before hitting that weight limit. FAA Approval for Air Travel. The Federal Aviation Administration (FAA) individually approves car seats for travel in airplanes. Most of the car seats included in our best infant and convertible car seat reviews are approved for air travel. If they are, they will have a sticker on the side, back, or bottom, that the airport might request to see before letting your baby sit in the car seat on the plane. So, if you plan on jet-setting with your baby or toddler, and want to secure them into their car seat for the trip, then definitely confirm that the car seat is approved by the FAA for air travel. Side Impact Protection. Nowadays, all car seats advertise some level of side impact protection. These range in thickness and body coverage. Some are single-layer and some double-layer, and some of them protect both the head and torso. Some newer seats also include adjustable side-impact protection, that allows you to maintain a relatively narrow car seat profile but to pull out protective side impact absorbers on each side to custom fit your vehicle. The Cybex Sirona is a good example of that. In our opinion, the more substantial the side impact, the better. But, also keep in mind that the seat will get more expensive, might get crammed for space inside, and might not fit very well into your car given the increased bulk. Steel-reinforced Frames. To provide structural rigidity, most convertible car seats (and a few infant car seats) use a steel or titanium reinforced frame. The reinforced frame is intended to increase structural rigidity of the car seat's frame to help in the event of an accident. 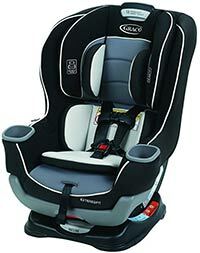 Most car seats made by Britax and Diono include steel-reinforced frames. Anti-rebound Bars. These are used for rear-facing infant or convertible car seats. The anti-rebound bar is attached to the front of the car seat and sticks up and sits against the vehicle's back seat. In the event of a rear-end collision, the anti-rebound bar is designed to reduce rotational forces and the likelihood of whiplash and neck and spine injuries. Only a few car seats have anti-rebound bars in the USA, though they are much more common in Europe. 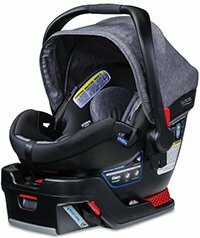 Good examples of car seats with anti-rebound bars include the Chicco Fit2 infant car seat, the Britax Advocate convertible car seat, and the Baby Jogger City View convertible car seat. Load Legs. Like the anti-rebound bar, the load leg is designed to reduce rotational forces in the event of a rear-end or front-end collision. In a rear-facing car seat, the load leg sticks down from the bottom rear of the car seat and stands on the floor of the backseat. These are relatively rare in the USA, but common in Europe. A good example is the Peg Perego Primo Viaggio Nido, which includes both an anti-rebound bar and a load leg. Energy-Absorbing Foam. Energy-absorbing foam is placed in the shell of the car seat, typically in the sides, bottom, and back, to increase safety in the event of an accident. The two most common types of energy-absorbing foam are EPP and EPS. Both types have exceptional performance, and will reduce the amount of energy absorbed by your child in an accident. Crash Testing Performance. The federal government conducts crash testing on car seats but does not publish the results. The rationale is that all car seats approved for sale in the USA pass their rigorous safety tests, and that revealing which seats did better than others will only make parents paranoid and shift the entire market toward and away from certain brands and models. But several other organizations, such as Consumer Reports and the Insurance Institute for Highway Safety (IIHS, but they only do booster seats), perform crash testing and provide the results to the public. Some other websites do their own crash testing, such as Wirecutter. This is commendable, but one issue with this approach is that they only pay for a small subset of available car seats to be tested, and the testing methodologies provided by outside contractors are not always perfectly reliable, sensitive, or comprehensive. For instance, some testing only considers front-impact, some only considers side-impact, and some do both but only on a small subset of car seats that they assume will come out on top before they even do the testing. Wide Adjustability. To make sure your baby is safe and comfortable, and the car seat is versatile enough to support a growing baby, you want the seat to have a wide range of adjustments. This includes headrest and harness height adjustments (5 or more height positions is great), crotch buckle adjustments (2 is great), wide recline adjustments (5 or more recline settings is great for fitting different vehicles), and maybe even adjustable leg room when rear-facing (like seen on the Extend2Fit). 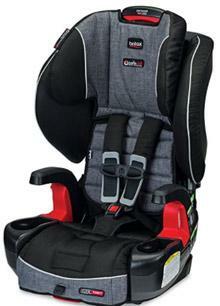 Of course, there are several other features to look for, including the comfort of the padding and harness, the ease of use, the convenience features (like cup holders and storage pockets), the breathability of the fabrics, the inclusion of an infant insert to comfortably support newborn babies, easy installation (like with the Britax ClickTight system), seatbelt lock-offs, and more.